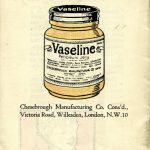 Vaseline Intensive Care is basically a bit of a household name – it’s been around since 1870 when Petroleum Jelly was first discovered as a dry skin heeler and over the 170 years of the brands history has been developed and updated to make it into the product it is today. 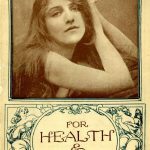 I’ve always found that Vaseline has been a good bet for the dry skin on my body – I want something that smells good OR the smell is invisible so it doesn’t interfere with perfume, plus is affordable so I can slather it on without any guilt. Hence why Vaseline ticks the boxes for me. This range is the new & improved Vaseline Intensive Care range and includes four variants: Cocoa Radiant – with cocoa butter, Essential Healing – a good every day product if you have only lightly dry skin, Aloe Soothe – helps soothe and hydrate skin, I love this one as a refreshing lotion for Summer or as an aftersun. Then there’s the new Advanced Repair – which is fragrance free and promises to heal even very dry skin in five days. Which is pretty perfect timing as I’ve been using this daily since the day after I got back from honeymoon. I can totally vouch for those little micro jelly beads… they do the trick. Well, I can’t actually see them in the formula – but apparently they’re there and they’re the secret to my skin feeling really lovely and smooth and hydrated. So far – zero peeling (although I didn’t get burnt, this still seems to always happen post holiday) and my skin actually feels better than it does normally. 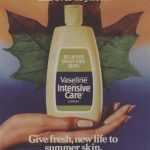 The lotion itself for the Vaseline Intensive Care Advanced Repair is quite thick, so can take a bit of a squeeze to get enough out -but once it’s out it absorbs into skin really quickly. Light a much lighter lotion – so it feels like a happy balance between really rich and hydrating but also light and refreshing. Because it comes in these huge bottles you can also slather on as much as you want without thinking it’s going to run out any time soon. From £1.99 for 200ml – it’s a total body-bargain. Oh, and as I mentioned – another bonus is that it’s fragrance free. So one of those subtle but effective products – that just does a great job and doesn’ get in the way of anything else. 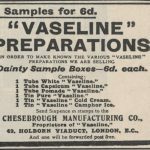 The range all includes the micro jelly beads I mentioned – which are basically very small droplets of the Vaseline Petroleum Jelly – the core ingredient to the brands heritage. Taking you back to the history of the brand for a moment – I do love a peek down memory lane. 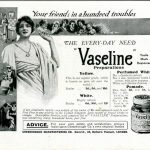 So have a few of the vintage pictures from the Vaseline brand’s history. 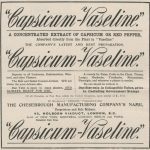 Always amusing to have a read… Capsicum-Vaseline… isn’t Capsicum a spicy chilli…ouch?! 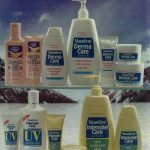 For more information on Vaseline Intensive Care visit the brand’s Facebook or Twitter feed. I have the yellow one, and it’s lovely 🙂 I’d like to try the cocoa butter one – I bet it smells amazing!